There is nothing like a nice warm bowl of soup to warm you up and french onion soup is hands down my favorite soup. It’s so simplistic and yet has such a deep taste. I’m also a huge fan of caramelized onions so that could be a big reason for my love of this soup. 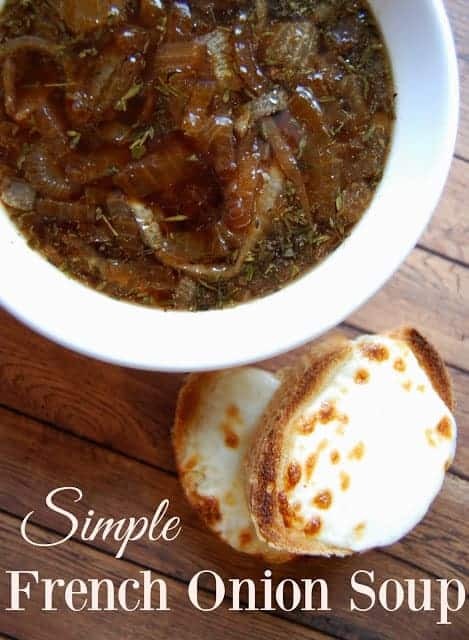 This simple french onion soup is easy to make and doesn’t require a lot of ingredients. In fact, it requires just six ingredients if you ignore the bread and cheese part! I need to remind myself that I usually have all the ingredients for this soup on hand. I could have a bowl many more times a year than I currently do if I just remembered that I have the ingredients! French onion soup traditionally uses wine in the recipe but I never have wine in the house. Balsamic vinegar steps in as a great replacement and I almost always have it on hand! Now that’s it’s officially fall and the weather is getting cooler, there’s no reason to not make this soup and thus I am now sharing it with you! So raid the pantry for these ingredients and start cooking. I dare you to not eat the whole pot yourself! In large pot, melt butter over medium heat. Add in salt and onions. Cook for about 30 minutes or until caramelized. Pour broth into the pot and add in the thyme. Simmer for 20 minutes. Add in balsamic vinegar. Pour soup into oven-safe bowls, place a slice of cheese on top of a slice of baguette. Now place the bread on top of the soup. Put all bowls on a baking sheet and place under the broiler until cheese has melted. Alternatively you can just top a slice of baguette with cheese and put that under the broiler and then serve the bread on the side (that is my preferred method as I’m not a fan of soggy bread.) Serve immediately. Note: You can use any nice french loaf of bread in place of a baguette. You also do not have to use gruyere. I’ve been known to use swiss, gouda, and even mozzarella. Not quite traditional but it works for me. I could eat this once a week, no problem! Great picture! Looks delish! I've never made it from a racy but this I can do! Thanks for sharing on #simplysundays link up! 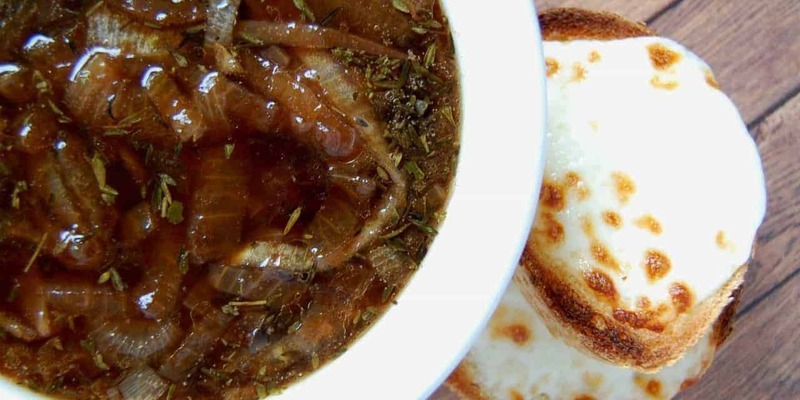 I've always thought that French Onion soup would be difficult to make because you only find it at "fancy" restaurants. You make it sound so simple to make. I can't wait to give it a try. Thanks for sharing this with all of our Let's Get Real readers. Sigh… I wish onions and I got along better! 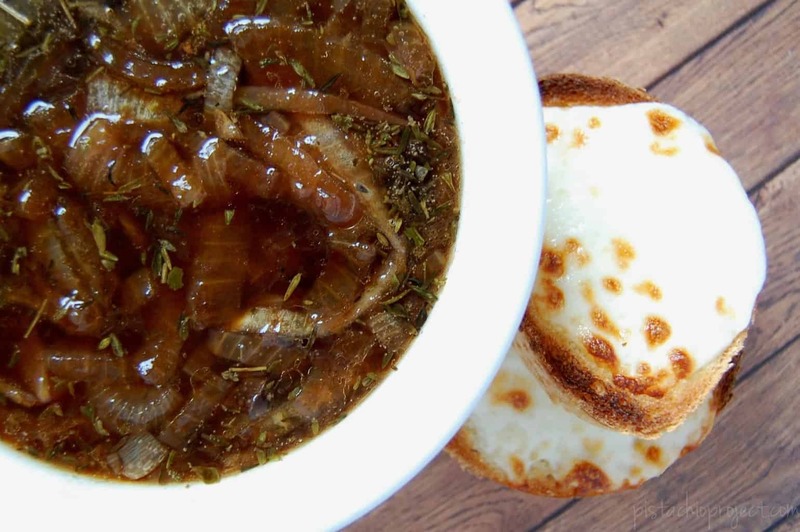 I love the taste of French onion soup, but the texture is something I can't handle! 😉 Thanks for sharing it at Savoring Saturdays, Brittany! Hope you'll be back this weekend. It’s on the stove as I am typing..Can’t wait to eat this for dinner..